We were given a fondue pot as a wedding present, and we love it! 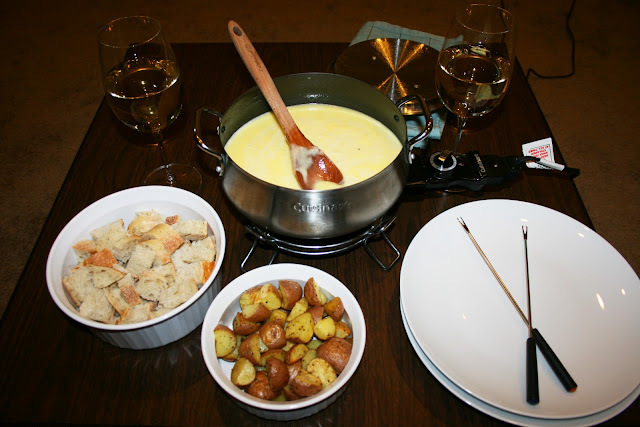 The first time, we went to the store and bought a box of fondue mix that is already pre-made. It was okay, but not great and certainly not fabulous. So, I went on the hunt and came across a recipe on Real Simple. I knew I had to try it. I changed it up just slightly, so my recipe is as follows. *TIP: I use my favourite Gewurztraminer from St. Clair Winery. But for all of my Washingtonian readers out there that may not want to order this FABULOUS New Mexico wine, may I suggest my second favourite: Gewurztraminer from Columbia Valley. ash and quarter your potatoes. Spread potatoes in a single layer on a shallow roasting pan. Sprinkle olive oil over the potatoes. Add a dash of salt and pepper (I always add more salt than pepper). Stir to coat, and spread out again in a single layer. 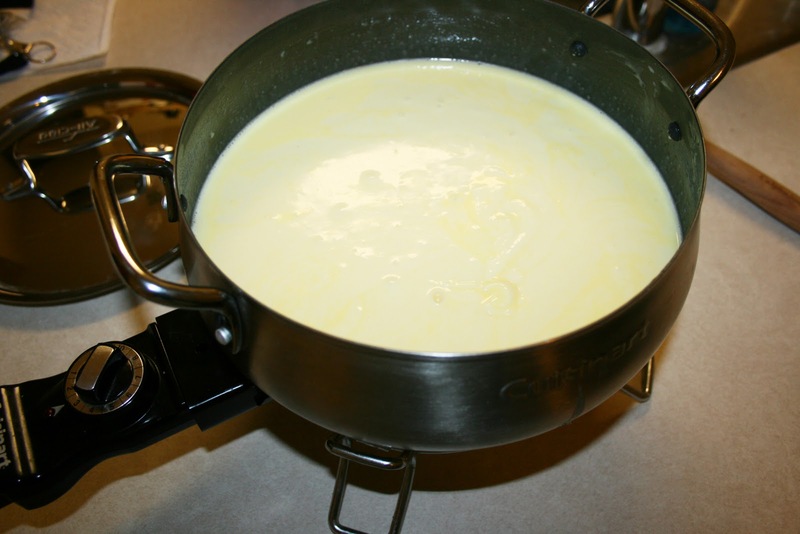 Place the pan in the preheated oven and cook for approximately 15 minutes, or until golden. Rub the inside of a medium saucepan with the garlic clove halves; discard garlic. 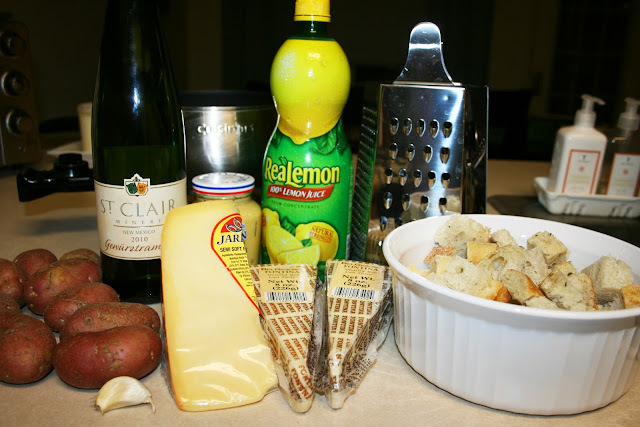 Add the wine, lemon juice, and mustard. Heat until simmering over medium heat. 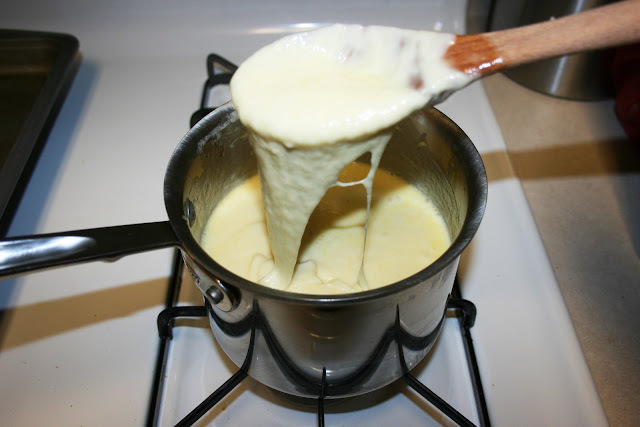 Add the cheese, 1 cup at a time, and stir with a wooden spoon until smooth. - Make sure you keep this on medium heat so you don't burn the cheese! Pour smooth cheese mixture into a fondue pot to stay warm as you eat. I dare you to not gorge yourself on this tasty goodness. In fact, I might just have to go grab one.more.bite.